Broadway Tower (The Highest little castle in the Cotswolds) is one of England’s outstanding viewpoints and, at 1024 feet (312m) above sea level, it is the second highest point on the Cotswold Ridge. The "Saxon" tower was designed by James Wyatt in 1794 to resemble a mock castle, and built for Lady Coventry in 1799. The tower was built on a "beacon" hill, where beacons were lit on special occasions. Lady Coventry wondered if a beacon on this hill could be seen from her house Croome Court in Worcestershire and sponsored the construction of the folly to find out. The beacon could be seen clearly. Over the years, the tower was home to the printing press of Sir Thomas Phillips, and Pre-Raphaelite artists including designer, writer and craftsman William Morris. Broadway Tower served as his country retreat for a period of time. The tower is on the Cotswold Way Walk which is easily reached by following the Cotswold Way from the A44 road at Fish Hill, or by a steep climb out of Broadway village. The tower itself stands 55 feet (17 metres) high. The Tower has had a lot of film exposure in cinema films such as Sherlock Holmes, The Gemini Factor, Interceptor, Crush with Andie McDowell and many others. The tower has also featured on many TV programmes. 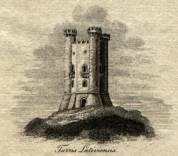 The Tower is a perfect example of an eighteenth century Gothic folly from which it is possible to survey an area which includes as many as sixteen counties of England and Wales. The views encompass the Vales of Evesham and Gloucester and on a clear day you may also see across the Severn Valley and as far as the Welsh Mountains. Today, the Tower houses fascinating exhibitions connected with its past and the surrounding area. Noteable occupants include Sir Thomas Phillips, renowned printer of his time and Pre-Raphaelite artists including designer, writer and craftsman William Morris, who used the Tower as a country retreat. The Morris Room is furnished with some of his more famous designs. The Royal Observer Corps used the unique vantage point to track enemy planes over England during the world wars of the 20th Century and later constructed a nuclear bunker to report nuclear attacks during the "Cold War". 10.30am-5.00pm daily (April-October), 11.00am -3.00pm Saturday and Sunday. Schools and Educational visits are welcome. Opening times may vary according to weather conditions. Adult £4.50, Child (4-14yrs) £2.50, Concessions £4.00. Family ticket £12.00 (2 adults and up to 2 children 4-14yrs). Broadway Tower is one of England's outstanding viewpoints with unrivalled views that survey an expanse of a 62 mile radius and as many as 16 Counties.